NEW! 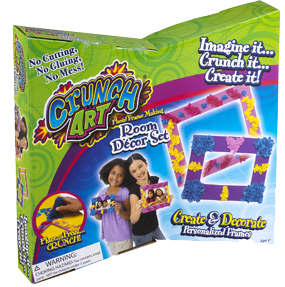 With Crunch Art®, you can make incredible art creations without the cutting, the gluing or the mess! There’s no limit to your creative possibilities!Crunch Art® lets you design colorful projects with fabric and foam. Simply place a foam template on the Crunch board & use the Cruncher to press fabric into the foam. Hear the “CRUNCH!” from the board & see the magical burst of color! Crunch your fabric into any design to complete each project. It’s fun, safe & mess-free! 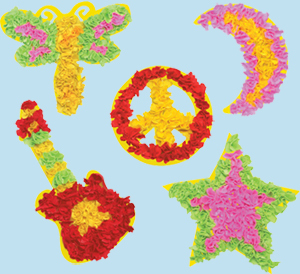 •5 fun foam shapes to design: Guitar, Peace Sign, Star, Moon & Dragonfly! •4 foam frame covers to mix & match designs: (2) 3" x 5" and (2) 5" x 7"
I'm always in search of great craft projects for the kids and I to do together, and even more so with the Winter in full swing (leaving us with tons of time on our hands to get creative indoors). I was excited by the concept of the all new Crunch Art Craft Kits by Little Kids Inc., and couldn't wait to see what the kids thought of them (bonus: they are mess free project kits, no cutting or gluing required! crafts without the mess? I was EXCITED). We received both the Crunch Art Mega Set and the Crunch Art Frame Making Set, and both were loads of fun! I was concerned that it may be too difficult for the princess, and that maybe B would be the only one that could do it, however it was very easy, and we all had a great time! We started with the Mega Set; I laid out the "Crunch Art board" & tool, an assortment of fabric squares and let the kids pick a shape to "Crunch Art". The princess & B simply laid a fabric square on the foam shape (on the Crunch Art board) and pressed the plastic tool to "crunch" the fabric square. They repeated with multiple fabric squares in various colors, and both were so proud of the finished product, that we hung them up in the Playroom! The next day we pulled out the Frame making kit for some more Crunch Art FUN, with the idea that we would put each of their pictures in the frames for family members as special handmade Holiday Gifts. 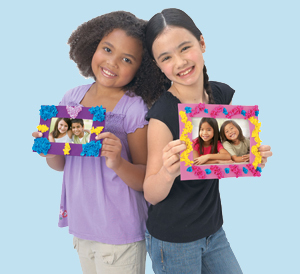 Both the princess, and B made two Frames each and then we easily taped a picture on the frame insert/backing and attached it with the included plastic clips. Both kits were so much fun and a wonderful way for the kids to get creative and use their imaginations! We are HUGE FANS of Crunch Art in our home, I know that we will be purchasing more of these wonderful craft kits for ourselves and as Gifts in the near future. A great project.....without the mess! Wonderful Arts & Craft project to keep the kids busy on those cold Winter days! 1 Crunch Art Mega Set + 1 Crunch Art Frame Making Set! Leave a comment~ Visit http://www.littlekidsinc.com/ and let me know another product that you would love to have to occupy your little one's this Winter. The comment is considered your entry. 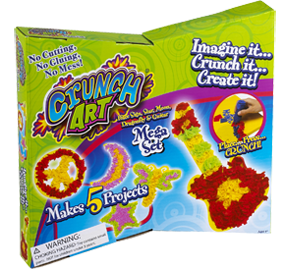 2) Tweet ~ #WIN a Crunch Art Mega Set+ Crunch Art Frame Making Craft Kits @savvycouponmom http://bit.ly/eph9Ns #GIVEAWAY (can be repeated twice daily for additional entries~ copy paste please~cut and paste- the bit link must be posted in the tweet - I will check) (Additional 5 Entries - 5 Comments). I am a public follower and I would love to have the Spongebob Big Bubble Wand. Following Little Kids Inc on twitter. My daughter would also love the flower and butterfly set! I'd love to have the Squeeze 'n Blow Pop-Up Bubbles™ too. I think my kids would enjoy the No-Spill Cowboy Bubble Shooter! My boy's would love the: No-Spill® Cowboy Bubble Shooter! My son would love the Jelly Belly Scented Bubbles to Go!